a-ha released their first live album on 24th March 2003 in Germany, Norway, Austria, Denmark, Holland, Spain and Sweden. The album was also released in Belgium (25th March), France (25th March) and Switzerland (21st March). The title of the live album is a line from a-ha's song "The Swing Of Things". It was recorded during the 2002 "Lifelines" world tour and is completely live with no over-dubs. The last 6 weeks of the tour were recorded and the best quality recordings were chosen (see below for details). There were three different versions of the album released. The regular release is a single 14-track CD. There were also two double versions which contain the regular album plus a bonus disc with 6 live tracks and behind-the-scenes footage filmed by Lauren Savoy (approx. 9 minutes long). One of the double albums came in a limited edition digi-pak with a poster. The cover of the album features a photograph of a seal in water by photographer Per Maning. 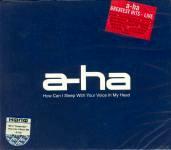 "How Can I Sleep With Your Voice In My Head" is printed in white capital letters along the top of the sleeve, with "a-ha" and "live" in respectively red and black letters. On the outer wrapping of the digi-pak, there is a red sticker with the text "a-ha ALL THE HITS LIVE feat • The Sun Always Shines On TV, • Summer Moved On, • Forever Not Yours, • Take On Me, INCL. POSTER 5050466-3331-5-5". There is also a clear transparent sticker with white text indicating that the CD is copy protected. The digi-pak folds out both sides to reveal the 2 CDs in the centre. Behind the CDs is a live shot of the band on stage at Ullevaal in Oslo (taken from the back of the stage, behind Magne) and the crowd which can be seen in part through the transparent CD trays. 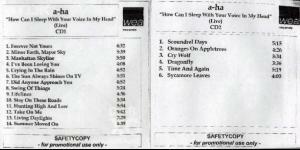 The CDs feature a shot of grey water with the title; "HOW CAN I SLEEP WITH YOUR VOICE IN MY HEAD" printed mainly in white, "a-ha" in orange and the word "LIVE" in black. Above the centre ring on disc one is a white squared "WEA" logo, whilst on disc two it's instead displayed below the centre ring. There is some Manufacturing and Copyright information displaying again in white around the outer top edge of both discs; "5050466-3331-5-5 ℗ 2003 Wea Records / Warner Music Group Germany GmbH & Co Holding OHG. An AOL Time Warner Company. All rights of the producer and of the owner of the work reproduced reserved. Unauthorized copying, hiring, lending, public performance and broadcasting of this record prohibited. Made in Germany by Warner Music Manufacturing Europe. GEMA/BIEM LC 04281". Both ends of the digi-pak have been left open: one holds an 8 page booklet with live shots from the tour plus individual portrait pictures of the band members. Quotes taken from the song "The Swing Of Things" have been printed across the pictures in various colours. Towards the back of the booklet, the track details are printed in white. The other end of the digi-pak houses a 24cm x 36cm mini double sided poster. One side features another shot of the band on stage in Oslo (again taken from the back of the stage behind Magne. 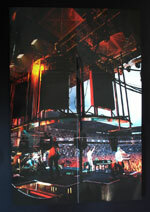 The other side shows a closer shot of Morten on stage at Ullevaal, Oslo. The reverse of the digi-pak features more shots of seals plus a shot of the empty Ullevaal stadium, over which the track list is printed in white down the left hand side for each CD1 & CD2. There is a white barcode "5 050466 333155" included in the top right hand corner with some Manufacturing, Production and Copyright text also shown in white underneath; "℗ & © 2003 Wea Records / Warner Music Group Germany GmbH & Co Holding OHG. An AOL Time Warner Company. All rights of the producer and of the owner of the work reproduced reserved. Unauthorized copying, hiring, lending, public performance and broadcasting of this record prohibited. Made in Germany by WARNER MUSIC MANUFACTURING EUROPE". The "www.wea.de" and "www.a-ha.com" website addresses, "WEA" white logo, "LC 04281" coding and Catalogue number 5050466-3331-5-5 are also additionally included. The regular double album comes in a slim-line jewelcase. Some of the jewelcases come with a red sticker similar to that found on the digipak, but without the text relating to the free poster. There is also a "Copy Protected sticker". The CD booklet, discs and back sleeve are similar to that of the digipak release, but there is no free poster included. The regular single album has similar packaging compared to the double album, but doesn't include the second bonus disc. The album was mixed by Michael Brauer in New York and mastered by George Marino. The backing band present on this album are: Anneli Drecker on backing vocals, Sven Lindvall on bass, Per Lindvall on drums and Christer Karlsson on keyboards. The live version of "The Sun Always Shines On TV" will be released as a single. Click here for more information. There is a promotional copy of the double album which comes in a pale blue and white "WEA" sleeve. The top third of the sleeve is white with small blue "WEA"-logos, while the bottom section is pale blue with one large white "WEA"-logo in the centre. 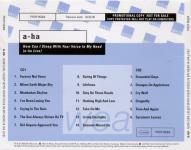 "a-ha" is printed in black letters inside a white strip with the title; "How Can I Sleep With Your Voice In My Head (a-ha Live)" in white letters on a black strip directly underneath. The Catalogue number; "PROP 05304", "Release date: 10.02.03" and promo details; "PROMOTIONAL COPY NOT FOR SALE COPY PROTECTED - WILL NOT PLAY ON COMPUTERS" are in black and white letters on respectively white and black strips. The back sleeve is of similar design to the front, showing the same Catalogue number, Release date & Promotional Information, but the tracks are additionally listed in black letters in the bottom section. There is also some "LC 04281" coding included. Along the bottom of the back sleeve is some Production and Copyright text printed in black which reads; "℗ & © 2003 Wea Records / Warner Music Group Germany GmbH & Co. Holding OHG. An AOL Time Warner Company. Made in Germany by WARNER MANUFACTURING EUROPE All rights of the producer and of the owner of the work reproduced reserved. Unauthorized copying, hiring, lending, public performance and broadcasting of this record prohibited". 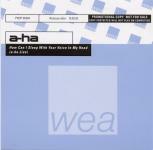 The discs are of similar design to the front cover; the bottom section is pale blue with black text and the top section displays the title; "a-ha How Can I Sleep With Your Voice In My Head (a-ha Live)" and contains small blue "WEA-logos" on a silver background. The "PROMOTIONAL COPY NOT FOR SALE", "LC 04281"" coding, Catalogue number PROP 05304" and "Made in Germany by WARNER MUSIC MANUFACTURING EUROPE Copy Protected - Will Not Play On Computers" is all shown on the left hand side. The same Copyright Information which is displayed on the back sleeve is additional printed around the outer edge of each discs. This promo CD was made in Germany, but was produced for the Norwegian market. The promo album does not include the video track and is copy protected - will not play on computers. Note: "Did Anyone Approach You?" is listed without the ? at the end, "The Swing of Things" and "The Living Daylights" are listed without "The" at the beginning and "Time & Again" is listed as "Time And Again". There is also a double Norwegian promo album which comes in a black and white text printed sleeve. The tracks are printed down the centre of the sleeve with the wea logo in the top right hand corner. At the bottom of the sleeve is the text "Safety copy for promotional use only". The track list is printed in the same way as that on the blue and white promo except that "Minor Earth, Major Sky" is printed incorrectly as "Minor Earth, Mayor Sky". There is a Bulgarian cassette album of "How Can I Sleep With Your Voice In My Head" which comes with the usual long fold-out sleeve. There is a silver "Б.А.М.П" hologram sticker at the bottom right hand corner of the front sleeve. On the back cover there is no barcode included, but displays instead that the cassette was "Manufactured by Orpheus Music, a Warner Music International Licensee" with the Catalogue number 5050466-3329-4-3 printed underneath. The regular German made Production and Copyright information is also shown; "℗ & © 2003 Wea Records / Warner Music Group Germany GmbH & Co Holding OHG. An AOL Time Warner Company. All rights of the producer and of the owner of the work reproduced reserved. Unauthorized copying, hiring, lending, public performance and broadcasting of this record prohibited. Made in Germany by WARNER MUSIC MANUFACTURING EUROPE", along with the "Wea" Records logo, plus "www.wea.de" and "www.a-ha.com" website addresses. The full track listing is also included and printed in white. 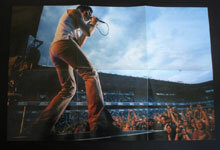 The front side of the fold-out insert includes a shot of an empty concert hall plus a close-up of Morten with the text "Oh, But How Can I Sleep With Your Voice In My Head" in white and yellow. Next to this is a shot of the stage plus a close-up of Paul with the text "With An Ocean Between Us And Room In My Bed" in light blue and white. 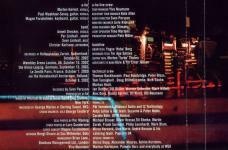 The reverse of the sleeve includes the album credits next to a shot of a seal underwater. Next to this is a shot of the band members on stage with the text "Oh, Have I Come To The Point Where I'm Losing The Grip" in bright blue and white. On the right of this, there is a shot of an outdoor arena filling with people, a close-up of Magne plus the text "Or Is It Still Time To Get Into The Swing Of" in yellow and white. The cassette itself is transparent clear with a grey centre piece and white printed text. Along the top in uppercase lettering is the title; "HOW CAN I SLEEP WITH YOUR VOICE IN MY HEAD/A-HA LIVE" with the full track listing to each side displayed underneath. On the left hand side, the "wea" logo, Catalogue number 5050466-3329-4-3 and "GEMA/BIEM" information is shown, whilst on the right hand side, it includes side "1" or "2", "120μs" logo and the "Dolby HX-PRO B-NR" symbol. Along the bottom of Side 1, it displays the same Copyright information which appears on the back sleeve, and the fact that the Cassette was again "Manufactured by ORPHEUS MUSIC, a Warner Music International licensee". On Side 2, the regular Record Company Production and Copyright information is instead shown; "℗ & © 2003 Wea Records / Warner Music Group Germany GmbH & Co Holding OHG. An AOL Time Warner Company". The European double 2CD set of "How Can I Sleep With Your Voice In My Head" was used for promotional purposes in Croatia and includes a silver "WARNER MUSIC" holgram sticker at the bottom right hand corner of the front sleeve. On the reverse of the back sleeve is an additional white sticker displaying a "DANCING BEAR" red and black vinyl logo with a Croatian contact address included; "Naziv robe: Nosac zvuka III slike Zemlja porijekia: Europska unija Proizvodac: Otisnut na proizvodu Godina uvoza: 2003 UVOZNIK: DANCING BEAR d.o.o. Heinzelova 47a, Zagreb; tel: 01/23 02 623". Some copies of the European single CD album sold in France come with a large red rectangular "RTL2" Radio Station sticker with the title in white; "a-ha HOW CAN I SLEEP WITH YOUR VOICE IN MY HEAD" at the top and the words; "Tous leurs tubes inclus" below in black and three of the tracks; "The Sun Always Shines On TV", "Take On Me", "Stay On These Roads", ect.. listed in white. The sticker goes right the way across the front of the CD case. The CD available in Moldova had a spelling mistake on the cover. The title is written incorrectly as "Nhow Can I Sleep With Your Voice In My Head". There is a different live shot of the band on the reverse sleeve which has pink lighting in the foreground. The font used also differs - white text with a black outline. It is thought that this release may be unofficial. There was a cassette version of the live album available in Moldova territory and independent states. It has similar sleeve to the regular European release and track list the same as the Russian Special Edition CD. The web links and e-mail addresses given on the sleeve are Russian. It is thought that this release might be unofficial. 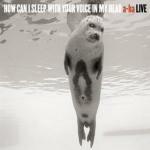 There is a special Russian edition of "How Can I Sleep With Your Voice In My Head" which was released by "НИКИТИН". The album comes in a dark blue card slipcase with the title printed in white letters at the centre of the sleeve. There is a red sticker with "a-ha Greatest Hits - Live" printed in white letters and some of the tracks listed underneath in black; "including •Hunting High And Low • Cry Wolf • Forever Not Yours • Minor Earth Major Sky • The Sun Always Shines On TV • Lifelines • Crying In The Rain • Summer Moved On • Take On Me • Stay On These Roads and more..." There is also a small silver hologram sticker included. On the back of the slipcase, the track listing is printed in white letters on the left hand side, with a white barcode "5 050466 638328" and some additional Production and Copyright text in both Russian and English; "℗ & © 2003 Wea Records / Warner Music Group Germany GmbH & Co Holding OHG. An AOL Time Warner Company. All rights of the producer and of the owner of the work reproduced reserved. Unauthorized copying, hiring, lending, public performance and broadcasting of this record prohibited. ℗ 2003 Фирма Грамзаписи НИКИТИН / www.records All rights reserved. E-mail: [email protected] Тел./ф. : (095) 781-27-63. Эксклюзивный дистрибьютер MC, CD в России/ СНГ: Торговая фирма НИКИТИН E-mail: [email protected] Тел.ф. : (095) 381-66-05." on the right hand side. The "wea" logo, LC 04281 coding and "www.records.ru" Website address are additionally include. The catalogue number also shown is printed incorrectly on the back of the slipcase as "5050466-6383-2-8//HH-166MC/03". The disc includes 3 of the tracks from the bonus CD, but doesn't include "The Living Daylights"
The sleeves of the CD which comes inside of the slipcase are of similar design to the regular European release, although the front sleeve is a double sided insert rather than an actual booklet and contains only the last two pages, showing the regular album and track credits. There is an additional white and blue Russian "Warner Music" logo printed on the bottom right hand side of the front sleeve, displaying that the album is only for sale in the territory of Russia and CIS Countries; "ДЛЯ ПРОДАЖИ НА ТЕРРИТОРИИ РОССИИ И СТРАН СНГ". The reverse of the sleeve includes the same Production and Copyright information in both Russian and Engish which appears on the back of the slipcase, but it comes without any of the copy protection text printed on it. The actual disc is silk screen printed giving it a metallic gold look, the text including the title "HOW CAN I SLEEP WITH YOUR VOICE IN MY HEAD" is printed in silver rather than the usual white. At the lower half of the centre ring under the "wea" logo, it additional shows "WARNER MUSIC РУССКОЕ ИЗДАНИЕ" (Russian Edition). Around the outer edge of the disc contains the same Production and Copyright text which appears on both the back sleeve and reverse of the slipcase. There is a Russian re-issue of "How Can I Sleep With Your Voice In My Head" which was again released onto CD by Никитин. It features the same tracks as the slip-case edition and comes in a jewel case, it is similar to the European release displaying the regular artworks and includes a picture obi-strip. The front of the obi is grey and matches the background image of the obi to the same section of the sleeve in which it covers. There is "WARNER MUSIC" logo in white displayed at the top, with some Russian text underneath in black about a-ha and this live album release; "ЭТО ГРУППА, СТАВШАЯ ИДОЛОМ ДЛЯ ВСЕЙ МОЛОДЕЖИ 80-Х (ROLLING STONE) СБОРНИК ЛУЧШИХ ПЕСЕН, ЗАПИСАННЫЙ НА КОНЦЕРТАХ ГРУППЫ В ПОСЛЕДНИЕ. ИЗДАНИЕ ВКЛЮЧАЕТ ВСЕ ГЛАВНЫЕ ХИТЫ a-ha В НЕПОВТОРИМОМ ЖИВОМ ЗВУЧАНИИ. ", it translates to; "THIS GROUP, WHICH WAS AN IDOL FOR THE WHOLE YOUTH OF THE 80's (ROLLING STONE). COLLECTION OF THE BEST SONGS, RECORDED AT THE GROUP'S CONCERTS IN THE LATEST. THE EDITION INCLUDES ALL MAIN CHARTS a-ha IN THE UNEXPECTABLE LIVING SURROUND". At the bottom of the front obi, it contains the image of a Russian flag with the text; "FOR SALE IN RUSSIA", it also displays the "ФИРМА ГРАМЗАПИСИ НИКИТИН" logo. The reverse of the obi again matches the image of the back sleeve in which it covers. At the top, there is some Russian white "Также в продаже:" (Also on sale:) text, plus shots of the available albums "Minor Earth, Major Sky 4607173154231" and "Lifelines 4607173154330" whilst at the bottom, the "ФИРМА ГРАМЗАПИСИ НИКИТИН" logo in the shape of a shield, white barcode "4607173 154187" and "www.fgnikitin.ru" website address are shown. The title is printed in white on the spine with the "ФИРМА ГРАМЗАПИСИ НИКИТИН" logo included on the left. On the back sleeve, the same English Production and Copyright information is shown which appeared on the earlier "НИКИТИН" slip-case edition;, there is however some additional Russian "НИКИТИН" Record Company contact details, plus "Do not expose to mechanical or magnetic influences. Avoid direct sunlight and moisture" information included; "℗ & © 2003 Wea Records / Warner Music Group Germany GmbH & Co Holding OHG. An AOL Time Warner Company. All rights of the producer and of the owner of the work reproduced reserved. Unauthorized copying, hiring, lending, public performance and broadcasting of this record prohibited. Произведено в России. Издателы: ООО «Фирма грамзаписи «Никитин» по зксклюзивной лицензии «Warner Music». ВСЕ ПРАВА ЗАЩИЩЕНЫ. Адрес для направления предложений и претензий: «Фирма грамзаписи «Никитин», 105082, г.Москва, ул.М.Почтовая Д. 12, стр. 1,тел. : (495) 232-13-87, e-mail: [email protected], www.fgnikitin.ru Зксклюзивный дистрибьютор: «Торговая фирма «Никитин»: тел. : (495) 265-49-07, 265-49-18; e-mail: [email protected], www.tfnretail.ru Изготовитель (см. информацию на внутреннем кольце компакт-диска вокруг установочного отверстия): ООО «Уральский злектронный завод», 620137, г.Екатеринбург, ул.Студенческая, д.9, корп. 11а.Лицензия ВАФ 77-15 от 21.09.07 г. ООО «Линос» 117587, г.Москва Варшавское шоссе, д.125ж стр 1. Лицензия ВАФ № 77-238 от 03.02.2006г. Музыкальный компакт-диск формата CD-DA. ГОСТ 27667-88, ГОСТ 28376-89, ГОСТ Р 51121-97. Содержит музыкальную запись. Не подлежит обязательной сертификации. Не подвергать механическому или магнитному воздействию. Избегать попадания прямых солнечных лучей и влаги". The back sleeve also includes the "ФИРМА ГРАМЗАПИСИ НИКИТИН" logo and same white barcode which appears on the obi-strip. The disc itself is grey and is similar to the European release displaying the title at the top and showing the regular artworks. Along the bottom, it includes the Никитин, "WARNER MUSIC" and "COMPACT disc DIGITAL AUDIO" logos in addition to the "wea" logo. Around the outer edge of the disc is some Russian and English Production and Copyright text which is similar to that on the back sleeve. The Catalogue number is 4607173154187. There is a Russian cassette release of "How Can I Sleep With Your Voice In My Head" which is thought to be unofficial. It was Released by DD Records and comes with a Purple Tinged front and back cover instead of the usual light grey one, The title is actual displayed landscape down the left hand side, the photo of the seal is also more to the right hand side, compared to usually being displayed in the centre of the front cover. On the spine is the catalogue number DD-1020MC displayed vertically at the top, whilst the title "HOW CAN I SLEEP WITH YOUR VOICE IN MY HEAD a-ha LIVE" is displayed in white landscaped in the centre, "A-ha" is in orange and "LIVE" is in black. At the bottom end is the text "DDRec" in black and white. 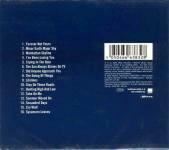 On the back cover, the track listing is displayed in landscape on the left hand side, whilst on the right hand side is a small barcode. On the inside of the folded insert, there is the track listing displayed in white down the centre on a pink patterned background, underneath is some copyright and production information. The cassette is transparent with Russian text in white. The Spanish record store "FNAC" gave away a free limited edition DVD with the first sold copies of the live double album. The DVD comes in a 5" card sleeve with a brown and white band shot on the front (Paul, Magne, Morten) and track listing on reverse. The title "a-ha The Videos" is printed in white on the front and reverse of the sleeve. The disc features the cover shot of the band, but in black and white. The title is printed in white letters on the top right hand side of the disc. The DVD features 13 promotional videos (mastered as only 1 track on the DVD) including the original video for "I've Been Losing You" (printed incorrectly as "I've been loosing you"), the live video of "The Sun Always Shines On TV", the slightly different version of Crying In The Rain (compared to that on Headlines And Deadlines) plus "Forever Not Yours", "Lifelines", "Did Anyone Apprach You?" and "The Living Daylights" which have not been previously released on Headlines And Deadlines or Live at Vallhall. The total running time is 55 minutes. Catalogue number: SP229W (Warner/ WEA). The Turkish cassette comes with the regular front cover artworks displaying the picture of the seal, and the title "HOW CAN I SLEEP WITH YOUR VOICE IN MY HEAD a-ha LIVE" in the three regular colours; white, orange and black across the centre. The title is also printed landscaped on the spine with the Catalogue number 5050466-3329-4-3 in white on the right hand side. The back sleeve is also similar to other cassette releases of the album displaying the white barcode "5 050466 332943" printed landscaped on the left, with the full track listing to each side orientated on the right. The usual Production and Copyright text is also present; "℗ & © 2003 Wea Records / Warner Music Group Germany GmbH & Co Holding OHG. An AOL Time Warner Company. ", but additionally includes some Turkish Record Company contact details; "WEA International Inc. lisansi ile BALET PLAK tarafindan yayinlanmistir. I.M.C. 6645-46 Unkapani - Istanbul. Tel: 0313 533 75 85". The "wea" logo, "www.wea.de" and "www.a-ha.com" Website addresses, plus Catalogue Number 5050466-3329-4-3 are displayed at the bottom. The inside of the insert folds-out to include the full credits information and regular artwork pictures. The tape is frosted with white text and comes with a different layout compared to the other releases. The title "a-ha LIVE HOW CAN I SLEEP WITH YOUR VOICE IN MY HEAD" is displayed at the top left hand side in large lettering. There is a small rectangular hologram sticker at the top right hand corner of side 1 displaying the text; "YAK MAL 231234 / BAKANLIGI T.C.KULTUR". On the left hand side we have a square "wea" logo, whilst on the right hand side it shows; "SEE INLAY CARD FOR DETAILS", plus some Turkish all rights reserved trademark text; "Her hakki mahfuzdur. T.M.". There is a Ukrainian "никитин" cassette release of "How Can I Sleep With Your Voice In My Head" which is similar to the Russian release. The front sleeve comes with similar artworks to the CD release and other cassette releases of the album, but the title; "How Can I Sleep With Your Voice In My Head" is displayed instead along the top in smaller font size lettering, rather than across the centre of the sleeve. The picture of the seal has also been cropped smaller, and is shown further to the right of the front sleeve. At the bottom right hand corner, there is a blue "WARNER MUSIC" logo with some Russian black text; "ДЛЯ ПРОДАЖИ НА ТЕРРИТОРИИ РОССИИ И СТРАН СНГ WARNER MUSIC®" which translates to read; "FOR SALE IN THE TERRITORY OF RUSSIA AND CIS COUNTRIES". The front sleeve also includes an additional silver "КОНТРОЛЬНА МАРКА" hologram sticker with A-ha "How Can I Sleep With Your Voice In My Head" and some coding; "A 722919 б3" printed in black. On the spine, the usual title; "HOW CAN I SLEEP WITH YOUR VOICE IN MY HEAD" is displayed landscaped in the centre, printed in white, with the regular a-ha in orange and word "LIVE" in black. The Catalogue number 5050466638342 HH-166MC/03 is shown orientated in white at the top, with a black "wea" records logo and "www.records.ru" Website address at the bottom. The back sleeve is smaller compared to other cassette releases of this album and the layout is somewhat different. The full track listing is printed in white and displayed landscaped at the top left hand corner. There is some English and Russian Production, Copyright and Record Company contact details printed underneath; "© & ℗ 2003 Wea Records / Warner Music Germany GmbH & Co Holding OHG. An AOL Time Warner Company. ℗ 2003 фирма г рамэаписи никитин / www.records. All rights reserved. E-mail: [email protected] ТЕЛ./ф. : (095) 781-27-63. Эксклюзивной дистрибьютер MC, CD в россии/снг: торговая фирма никитин E-mail: [email protected] ТЕЛ./ф. : (095) 381-66-05". At the top right hand corner of the back sleeve is a white barcode; "5 050466 638342". The inside of the insert is different to other cassette releases of the album and doesn't fold out or display any of the full artworks, it instead shows the full track listing printed in white, with the credits information page taken from the inside back page of the European CD booklet. The tape itself is transparent clear with white text and was Manufactured by "Euro Star", it comes with a different layout and design compared to the Russian release tape. The a-ha logo is displayed in the top centre with "LIVE" and the title; "HOW CAN I SLEEP WITH YOUR VOICE IN MY HEAD" underneath. The full track listing to each side is printed in very small lettering and displayed in-between the cassette cogs. At the top left hand corner, the "WWW.RECORDS.RU" Website address is shown with the "ФИРМА ГРАМЗАПИСИ никитин" Record Company logo at the top right. On the left hand side, the "wea" logo and "DOLBY HX PRO" symbol are included along with a shortened Catalogue number 666383-4. On the right hand side, the "EURO STAR" logo and SIDE "1" or "2" are shown. Along the bottom, there is some "никитин" Ukrainian Record Company, Copyright information and Website addresses; "℗ 2003 ФІРМА ГРАМЗАПИСУ "никитин" ВСІ ПРАВА ДОТРИМАНО НЕСАНКЦІОНОВАНЕ КОПІЮВАННЯ ТА ПУБЛІЧНА ТРАНСЛЯЦІЯ ЗАБОРОНЕНІ ВИРОБЛЕНО В УКРАТНЕ КОМПАНІЄЮ "КИІВ-ЄВРОСТАР" ПО ЛІЦЕНЗІІ "ФІРМА ГРАМЗАПИСУ никитин" WWW.EUROSTAR.KIEV.UA E-MAIL [email protected] [email protected]".